I had the best of intentions to finish my questions from my Q&A post. Which I have stretched out entirely way too long. But before I started the post to answer the questions, I decided I would do some laundry real quick. I am now a firm believer that there is no such thing as doing laundry "real quick." And this is going to be a pretty bold statement but I am also a firm believer that there is nothing worse than a certain jewelry company's commercials on TV. I'm not going to say the company's name, because that would be mean and some people sat around a table in a creative team meeting and came up with these series of commercials that have the cheesiest lines that I have ever heard in my life. Wow, that was a long run-on sentence. But they were probably proud of these commercial and I don't want to hurt their feelings. Because OBVIOUSLY people who work on the creative team at said jewelry company read my blog. I'm glad I can keep a clear level-headed mind over here. Anyways, every time I see these commercials I just bust out laughing. They are funny when they are not supposed to be. And sometimes that is the best kind of funny. I felt that it was ironic that several of these commercials came on while I was ironing about 20 of Luke's button up shirts. Which for the record button up shirts might be the hardest clothing item to iron. EVER. Which is also why I'm a firm believer in not washing your clothes. Because then they get all wrinkled, and then you have to iron them, and if the clothing item doesn't get wrinkled then it just feels all weird and takes about a good week before it "feels right" again, and then you start this cycle all over again. But apparently some people in this world think its gross if you don't wash your clothes. EVEN if you don't stink (which I never do). So my belated new years resolution is to start washing our clothes more, which means ironing more, which means lots of TV watching, which means I see the weirdest commercials ever. And while ironing these BEAST of shirts that I would have rather ripped up than ironed, this jewelry store commercial came on and I thought, I wonder if that young girl who is so excited to get that diamond and says the most ridiculous thing ever knows that one day she will be standing in an apartment ironing her husband's shirt, worrying that it's not de-wrinkled enough, wondering if people will notice and think she is the worst wife ever because she can't iron a simple button up shirt. And that my friends is a post coming full circle. Come Sunday, Luke will maybe wear one of these shirts on stage and I will see him and know that I ironed it for my man, and that will be better than any diamond he could give me. And we all know that's a lie. This post has gotten completely out of hand. Goodnight, I need to watch Titanic now. It's safe I know there are no cheesy lines in that movie. "I will never let go Jack." "And we all know that's a lie" just made me laugh out loud. This entire post made me laugh out loud!! I'm so impressed that you iron Luke's clothes...he is one lucky man! Alex irons his own and if I'm lucky, irons mine too. He's better at it than me. Ok, first off, I hate ironing. HATE IT. I have been known to not purchase super cute outfits solely on the fact that they would require ironing often. I can't even imagine the torture of ironing men's shirts and since I hate ironing with such passion, I may have already indicated that my "no ironing" rule will somehow make it into my vows. You are strange and also hilarious. I can see why we are friends. Ha ha, this is so funny. Totally something I would do. Nice job on the ironing, I loathe ironing. Ironing is the bain of my existence. However, Chris feels that sleeves and backs don't need to be ironed because no one will see them. So, if I don't do it, I know that someone will be thinking terrible things about his wife while he's giving some presentation. So...I iron on. Annnnnnd this is why we are friends. oh Titanic, can we please watch it together? I love that movie, can you recite every line too? I cried like a baby first time I ever saw, and still cry like a baby. If I wasn't at work I would be laughing hysterically out loud...but seeing as I am sitting at my desk I just giggled excessively to myself! Love this post! Oh and one way to avoid ironing...make Luke do it. Hubby is very particular about his ironing and so...he does it himself. I realize this is not very wifey of me...but hey, I figure they're his shirts, he can iron them! I am trying to figure out a way to just keep buying new clothes instead of taking the massive pile to the dry cleaners. I hate, hate, hate having to deal with that. Ugh. Every Kiss begins with K? Funny post my friend! Only you can write such a random post about ironing shirts and jewelry commercials and make it come full circle. That's talent kid. love reading your blog. you are so funny! completely agree about laundry. I have the best tip for you that will hopefully save you from ever ironing again! 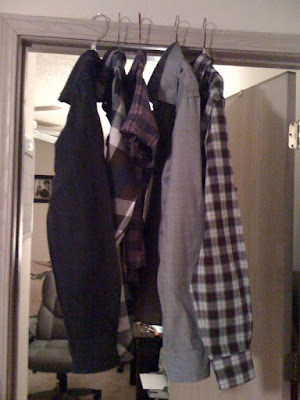 If you put the shirts in the dryer for only 5-10 minutes take them out, shake them and hang them to dry they don't need to be ironed! It's even easier if they go into the wash fully buttoned so that you don't have to mess with that when they are wet. Hope this helps. Sorry for giving unsolicited advice.